The only Jewish queen regnant with the exception of the usurper Athaliah; born 139 B.C. ; died 67 B.C. 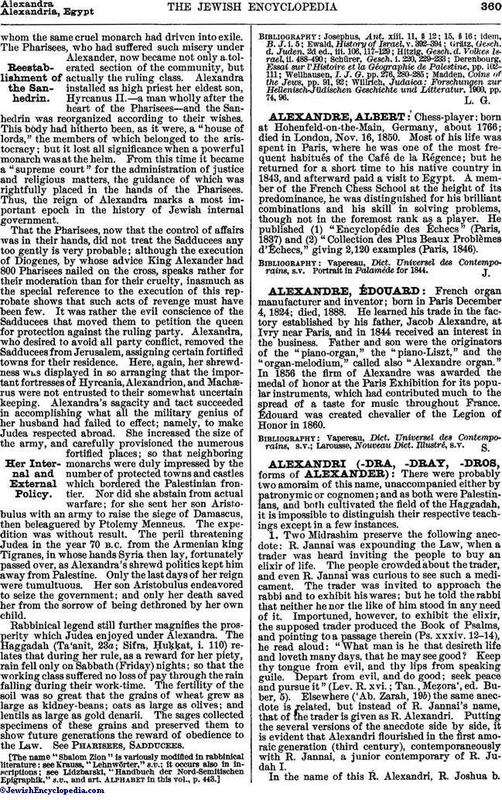 ; she was the wife of Aristobulus I., and afterward of Alexander Jannæus.That Alexandra, the widow of Aristobulus I., was identical with her who married his brother Alexander Jannæus, is nowhere explicitly stated by Josephus, who no doubt took it for granted that the latter performed the levirate marriage prescribed by the law for the widow of a childless brother deceased. Josephus' statement ("Ant." xv. 6, § 3), that Hyrcanus, Jannæus' eldest son, was eighty years old when he was put to death by Herod, in 31 B.C., must be erroneous, for that would set the year of his birth as 111 B.C., and Jannæus himself was born in 125, so that he could have been but fourteen when Hyrcanus was born to him. It is difficult to understand how a thirteen-year-old boy married a widow of thirty. The statement, made by Josephus ("Ant." xiii. 11, §§ 1, 2), that during the reign of Aristobulus she brought about the death of the young prince Antigonus I., because she saw in him a rival of her husband, lacks confirmation. On Aristobulus' death (103 B.C. ), she liberated his brother Alexander Jannæus, who had been held in prison. 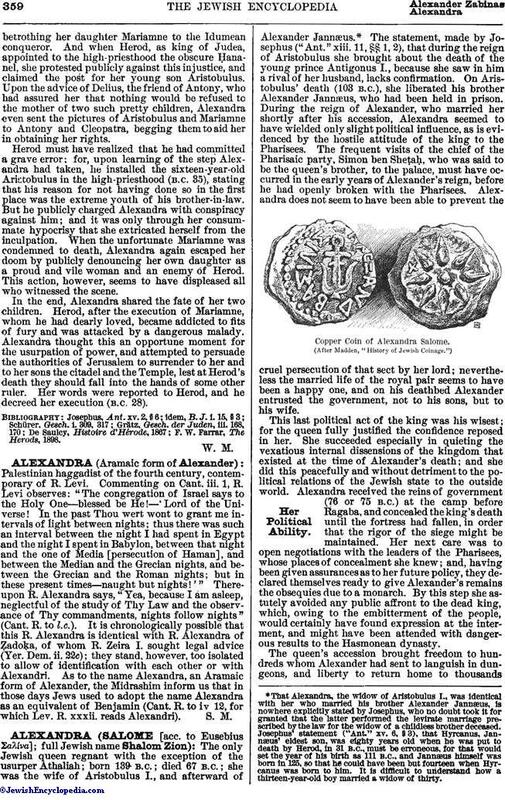 During the reign of Alexander, who married her shortly after his accession, Alexandra seemed to have wielded only slight political influence, as is evidenced by the hostile attitude of the king to the Pharisees. The frequent visits of the chief of the Pharisaic party, Simon ben Sheṭaḥ, who was said to be the queen's brother, to the palace, must have occurred in the early years of Alexander's reign, before he had openly broken with the Pharisees. Alexandra does not seem to have been able to prevent the cruel persecution of that sect by her lord; nevertheless the married life of the royal pair seems to have been a happy one, and on his deathbed Alexander entrusted the government, not to his sons, but to his wife. Copper Coin of Alexandra Salome. (After Madden, "History of Jewish Coinage. ")Her Political Ability. This last political act of the king was his wisest; for the queen fully justified the confidence reposed in her. She succeeded especially in quieting the vexatious internal dissensions of the kingdom that existed at the time of Alexander's death; and she did this peacefully and without detriment to the political relations of the Jewish state to the outside world. Alexandra received the reins of government (76 or 75 B.C.) at the camp before Ragaba, and concealed the king's death until the fortress had fallen, in order that the rigor of the siege might be maintained. Her next care was to open negotiations with the leaders of the Pharisees, whose places of concealment she knew; and, having been given assurances as to her future policy, they declared themselves ready to give Alexander's remains the obsequies due to a monarch. By this step she astutely avoided any public affront to the dead king, which, owing to the embitterment of the people, would certainly have found expression at the interment, and might have been attended with dangerous results to the Hasmonean dynasty. The queen's accession brought freedom to hundreds whom Alexander had sent to languish in dungeons, and liberty to return home to thousandswhom the same cruel monarch had driven into exile. The Pharisees, who had suffered such misery under Alexander, now became not only a tolerated section of the community, but actually the ruling class. Alexandra installed as high priest her eldest son, Hyrcanus II.—a man wholly after the heart of the Pharisees—and the Sanhedrin was reorganized according to their wishes. This body had hitherto been, as it were, a "house of lords," the members of which belonged to the aristocracy; but it lost all significance when a powerful monarch was at the helm. From this time it became a "supreme court" for the administration of justice and religious matters, the guidance of which was rightfully placed in the hands of the Pharisees. Thus, the reign of Alexandra marks a most important epoch in the history of Jewish internal government. That the Pharisees, now that the control of affairs was in their hands, did not treat the Sadducees any too gently is very probable; although the execution of Diogenes, by whose advice King Alexander had 800 Pharisees nailed on the cross, speaks rather for their moderation than for their cruelty, inasmuch as the special reference to the execution of this reprobate shows that such acts of revenge must have been few. It was rather the evil conscience of the Sadducees that moved them to petition the queen for protection against the ruling party. Alexandra, who desired to avoid all party conflict, removed the Sadducees from Jerusalem, assigning certain fortified towns for their residence. Here, again, her shrewdness was displayed in so arranging that the important fortresses of Hyrcania, Alexandrion, and Machærus were not entrusted to their somewhat uncertain keeping. Alexandra's sagacity and tact succeeded in accomplishing what all the military genius of her husband had failed to effect; namely, to make Judea respected abroad. She increased the size of the army, and carefully provisioned the numerous fortified places; so that neighboring monarchs were duly impressed by the number of protected towns and castles which bordered the Palestinian frontier. Nor did she abstain from actual warfare; for she sent her son Aristobulus with an army to raise the siege of Damascus, then beleaguered by Ptolemy Menneus. The expedition was without result. The peril threatening Judea in the year 70 B.C. from the Armenian king Tigranes, in whose hands Syria then lay, fortunately passed over, as Alexandra's shrewd politics kept him away from Palestine. Only the last days of her reign were tumultuous. Her son Aristobulus endeavored to seize the government; and only her death saved her from the sorrow of being dethroned by her own child. Rabbinical legend still further magnifies the prosperity which Judea enjoyed under Alexandra. The Haggadah (Ta'anit, 23a; Sifra, ḤuḲḲat, i. 110) relates that during her rule, as a reward for her piety, rain fell only on Sabbath (Friday) nights; so that the working class suffered no loss of pay through the rain falling during their work-time. The fertility of the soil was so great that the grains of wheat grew as large as kidney-beans; oats as large as olives; and lentils as large as gold denarii. The sages collected specimens of these grains and preserved them to show future generations the reward of obedience to the Law. See Pharisees, Sadducees. Willrich, Judaica: Forschungen zur Hellenisch-Jüdischen Geschichte und Litteratur, 1900, pp. 74, 96.